The Ellison’s Orange apple was raised by the Reverend. C.C. Ellison at Bracebridge and Mr. Wipf, gardener at Hartsholme Hall in Lincolnshire, England. First records of the Ellison’s Orange date back to 1904, being introduced by Pennells Nurseries, Lincolnshire in 1911. The RHS gave it an Award of Merit in 1911 and a First Class Certificate in 1917. Fruits have soft juicy flesh with a striped red skin. It is noted to have a rich, strong aniseed flavour when ripe. 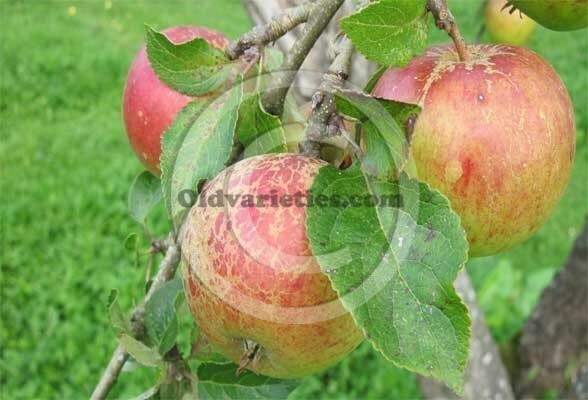 The Ellison’s orange apple can be found growing in the orchards of Acorn Bank House, Temple Sowerby, Cumbria.